Importing PST files has always been difficult because the process relied heavily on some of the Outlook DLL’s, but this is no longer the case in Exchange Server 2010 SP1. Microsoft has completely reengineered this, and built PST reading/creation logic directly into Exchange Server 2010 SP1. The process is now integrated into the Mailbox Replication Service (MRS), the same engine that’s also responsible for moving mailboxes between Mailbox Databases. The MRS is a process that runs on the Client Access Server, continuously scanning the Mailbox Database for move requests. If it finds a move request, it will process it and start moving a mailbox from one Mailbox Database to another. This is an online process, so users hardly notice that their mailbox is being moved. The mailbox is still accessible while it is being moved ( and that’s true when moving from Exchange 2007 to Exchange 2010 or between Exchange 2010 Mailbox Databases), and the mailbox also continues to accept new messages as they arrive on the Hub Transport Server. A similar process is used for importing PST files into mailboxes (and exporting PST files from mailboxes, of course); the only difference is that the source of the mail is not a mailbox, but a PST file. Suppose we have an Exchange administrator (ExAdmin) and, after he implemented Exchange Server 2010 SP1 (including the Personal Archives), he is now responsible for importing the PST files into the Mailboxes and Archives. The cmdlet to import PST files into the mailboxes is New-MailboxImportRequest. It takes a number of parameters, but the most important ones are, of course, the mailbox and the path to the file share where the PST file is located. The request does not accept a local directory, so you have to use a file share, but there’s a snag here: when creating the file share, you have to grant the security group “Exchange Trusted Subsystem” read/write permissions on that file share. A nice feature to see in this cmdle is the –IsArchive parameter, which is responsible for importing a PST file into the user’s Personal Archive. However, note that to use the Personal Archive, you’ll need an Enterprise Client Access License (eCAL). You should be aware This command is not available in the Exchange Management Console in Exchange Server 2010 SP1 – only in the Exchange Management Shell. 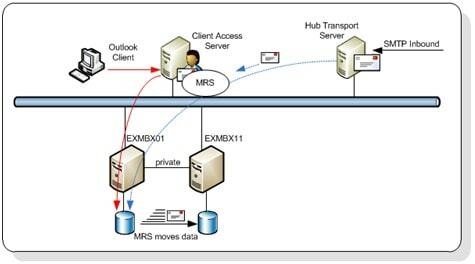 Performing the actual import of the data into the mailbox is a process which runs on the Client Access Server, as explained earlier when I mentioned the Mailbox Replication Service. So, after entering the import cmdlet, it is therefore possible to close the Exchange Management Shell and log off from the server or management workstation which has the management tools installed. It is also possible to enter multiple requests at the same time, or close to each other. The requests will be queued, and when the Client Access Server picks up a request it will then process them sequentially. Now that we’ve got the basics, I’ll mention that it’s possible to exclude certain folders during the import using the –ExcludeFolders parameter, and it is also possible to use a –SourceRootFolder parameter to define what data to import from within the source PST; everything outside of the targeted –SourceRootFolder will not be imported. Similarly, the –TargetRootFolder specifies the location in the mailbox where the import will store its data, for example in a \RecoveryFolder location in the mailbox. The mailbox which is to be targeted, is identified from the file name of the PST file; so student-1.pst will be automatically imported into the mailbox named “student-1”. When importing multiple PST files in the same batch, you’ll notice that only one or two imports are active at the same time; other requests have the status “Queued” and are only processed when previous imports are finished. One of the issues top bear in mind is to not overload the Client Access Server and the Mailbox Server during a PST import, which is why the import process is throttled. The good thing is that this throttling is fully configurable; so you can, for example, really stress your Mailbox Servers and Client Access Servers when you’re performing bulk imports on a Saturday or Sunday. 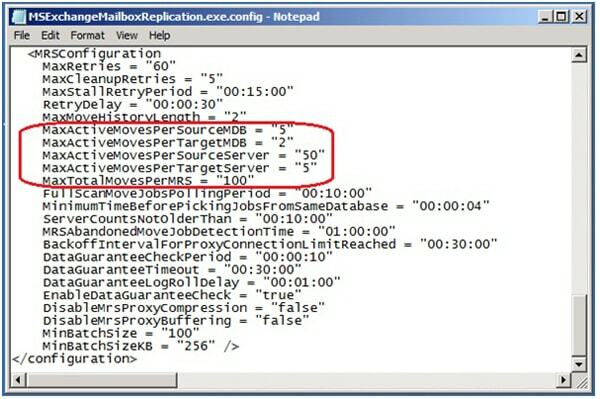 The configuration for this is stored in a config file called MSExchangeMailboxReplication.exe.config, which is stored (by default) in the directory C:\Program Files\Microsoft\Exchange Server\V14\Bin on the Client Access Server; when you open it with Notepad, you’ll find some “MaxActiveMoves” parameters which you can edit (which you can see in the image below). Please note that this file exists on every Client Access Server, which means that you’ll need to adjust across all CAS machines if you have a large Exchange organization & are doing a bulk import / export. As you can probably guess, increase the number of moves per target MDB and your Import Request will process more than just two PST files at a time. 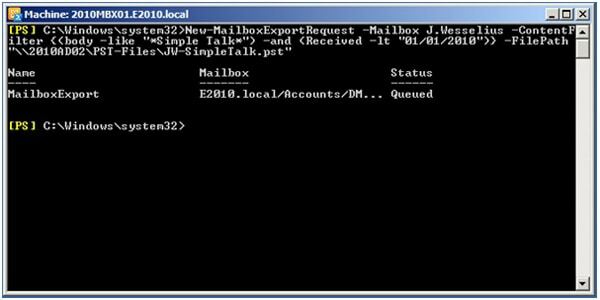 The import and export mailbox processes in Exchange Server 2010 SP1 have been improved, and – to be honest – it was about time. Importing PSTs is handled by the Mailbox Replication Service, the same engine that’s being used by the online Move Mailbox technology. The New-MailboxImportRequest and New-MailboxExportRequest cmdlets have quite a few parameters available, and you can filter the commands to customize them to your needs. The only downside is that the process is command-line only, but since Exchange 2007 came with PowerShell 3½ years ago, we are hopefully getting used to that.